Ahoy there me hearties! It’s me again, yer friendly app pirate who just got back from an exciting adventure around the seven seas. We are just docking the good old Jolly Roger for a couple of night’s break but ‘afore me and the crew will go around the city checking out the night scene, I will first be writing an app review for ye lads and lasses. The app that we have for review is something that will make yer brains think; and that is think hard! 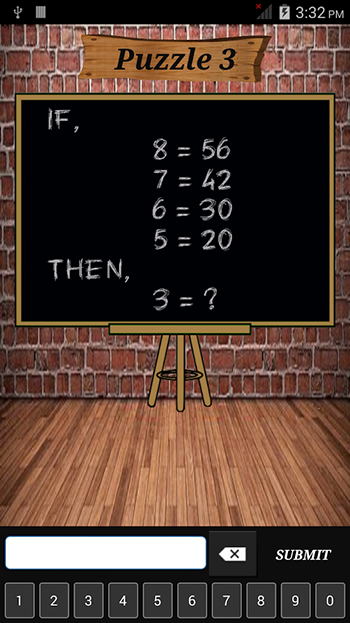 It’s called Math Puzzles by applabs. Batten down the hatches and let’s begin. Each level has the same background. There is a maroon bricked wall that has a blackboard and the puzzle level on top of it. At the bottom of the wooden floor is the box where you will enter the answer and next to it is the submit button. On the blackboard is where the puzzle that you need to solve is written. That is basically everything that you would see, but it’s not a deal breaker since an elaborate background is not needed for this type of app. It’s clean and organized look can actually help you focus more on the puzzle and think, which is the main purpose of the game. The puzzles are not your regular solve this math equation puzzle as it’s more a logic number game. You must not just learn how to add, subtract, divide, or multiply, but you have to think outside the box to find the solution. There are hints that show up when you have not entered an answer for a specific period. Some of them are helpful, although some of them are not. If you love logic games and you want to challenge yourself to solve puzzles that have something to do with numbers, then this app is something to consider. As of this writing, there are only 70 levels in the game. It may take time to complete all levels if you just play every now and then, especially some of them are difficult to solve, which would require a lot of time thinking. However, for those who are quick to solve the problems, they might be able to finish the puzzles in no time. There are levels however that are too hard to solve and if you get stuck, you can’t go to the next level as there is no skip option for that. Math Puzzle is free to play. It may have advertisements, but they are not intrusive so they are not that annoying. The puzzles are challenging and they will push you to think. There are only 70 levels, which may not be enough for those who are really genius at this type of game. There is no skip option to move to another level if you get stuck in one puzzle. 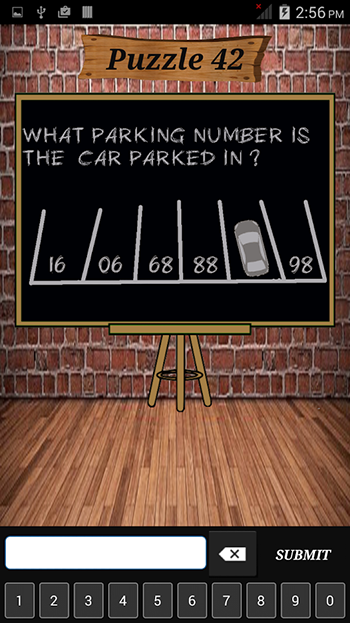 Math Puzzle is a highly recommended app for those who would like to exercise their brains. The puzzles are challenging and they would require you to think.